DIY budget-friendly shelves are a perfect solution for maximizing storage space in your home. With very little cash flow and some sweat equity, you can have some amazing cheap shelves throughout your home! Anyone who has read my blog for any amount of time knows that I’m a huge fan of shelving, especially the DIY kind! DIY shelves can change the look of your entire room and is a perfect project for any level of DIY-er. Plus, cheap shelves look just as good (if not better!) than pricey store-purchased shelving. I thought it would be fun to share my favorite DIY cheap shelves from around the internet that brilliant bloggers have made look incredible. As you’ll see, there is a DIY shelf option for every homeowner out there! 🙂 Here are 12 of my favorite ones. 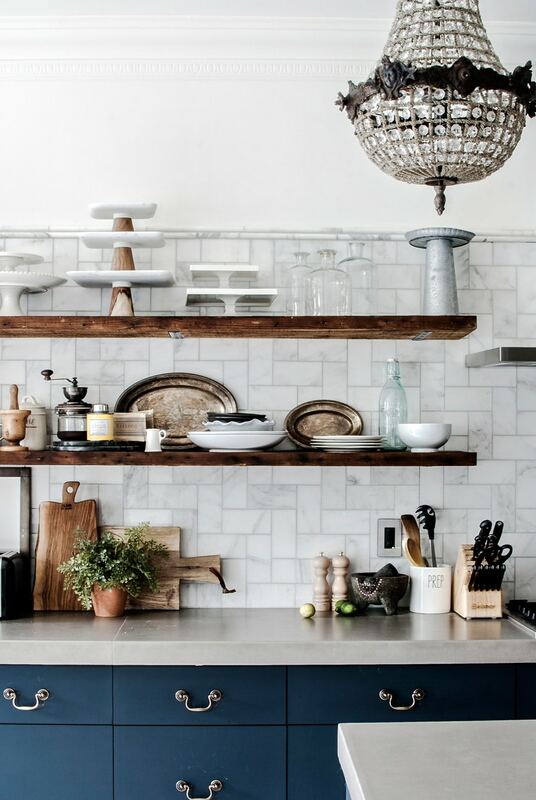 Open shelving in the kitchen has become all the rage in the last few years. 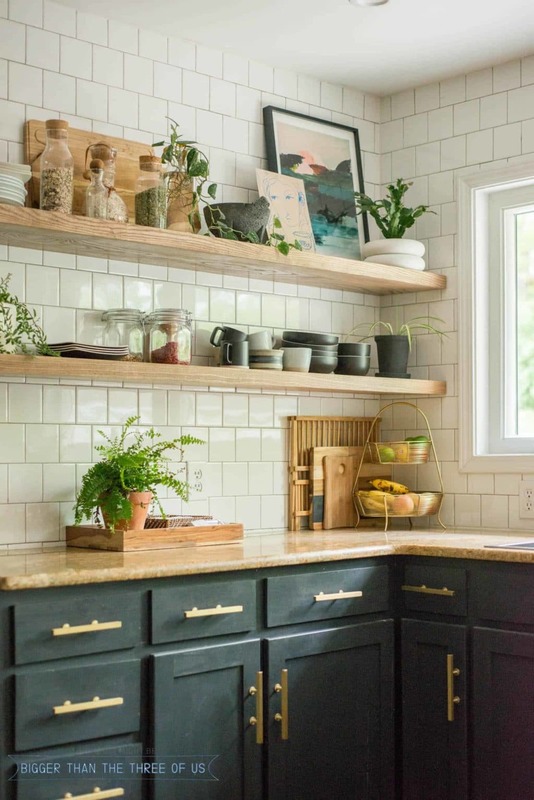 There are so many ways you can add cheap shelves in your kitchen, but one of the most popular ways is replacing either a section or all of your upper cabinets with open shelves. I LOVE the look of these shelves, but they wouldn’t work for me with my current set up. (I need storage, ya’ll!) However, as you will see, that didn’t stop me from adding DIY shelves in my kitchen anyway. Eat-in Kitchen Farmhouse Style Open Shelving. I can unbiasedly say these shelves are gorgeous! Okay, maybe not completely unbiasedly since this is my project! But I can say that these cheap shelves have been one of my most favorite DIYs in our whole home…and it only took an hour or so to install! Industrial Style Pipe Open Shelving. I love a good floating shelf and these shelves are gorgeous. 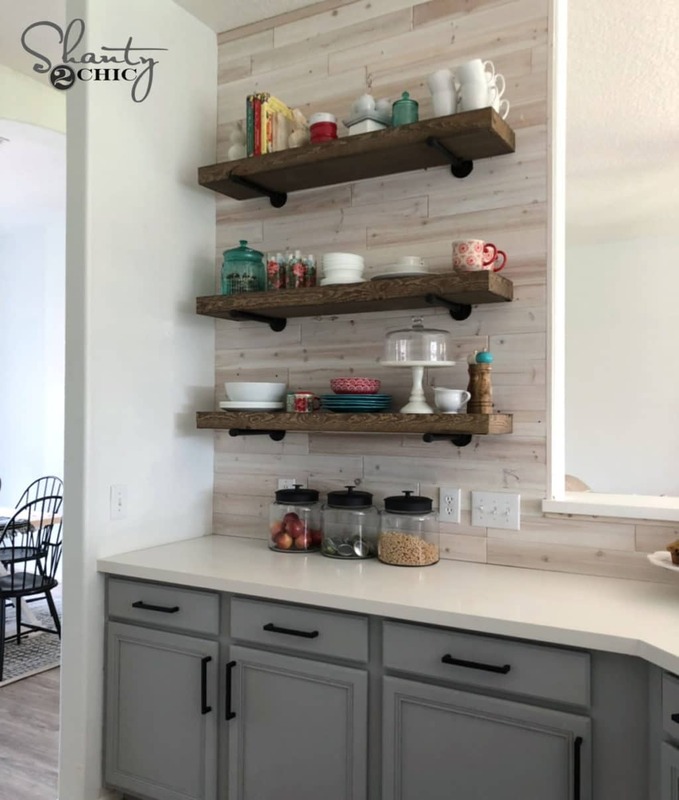 Shanty 2 Chic did a fabulous job of making cheap shelves look super high end in this kitchen (side note…I also love the backsplash!). I think these would work great in a laundry room as well! Herb Wall Kitchen Shelving. Finding a way to keep herbs accessible is always a challenge, but this indoor herb wall solves it. Since herbs need plenty of sunlight, this will really only work if it’s by an open window like this one in Run to Radiance’s kitchen, but I really like the concept. Reclaimed Barnwood Shelves. The shelves are made of reclaimed barn beams. 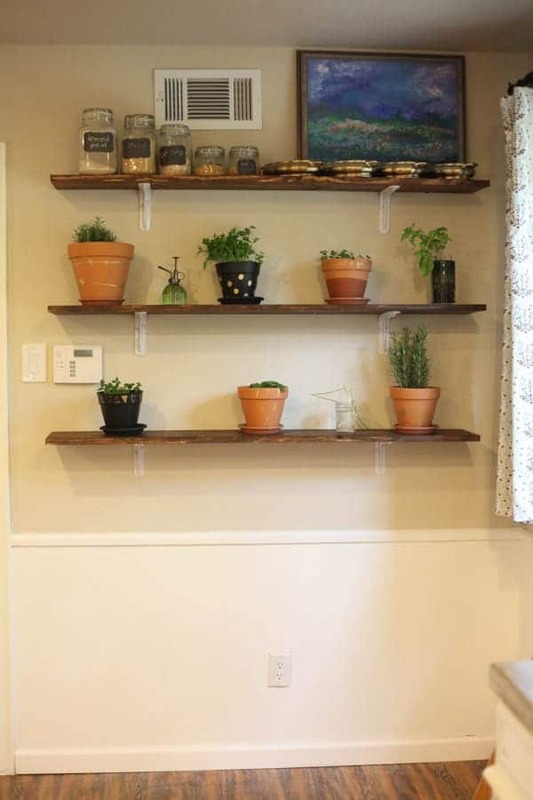 You could make this as DIY shelves and recreate a similar look by using standard wood planks from a home improvement store. Just make sure they are stained (or painted if you prefer!). I just love the bit of drama the lighting adds too! Rustic Glam Kitchen Shelves. These DIY shelves have the perfect amount of rustic wood meets metallic glam. 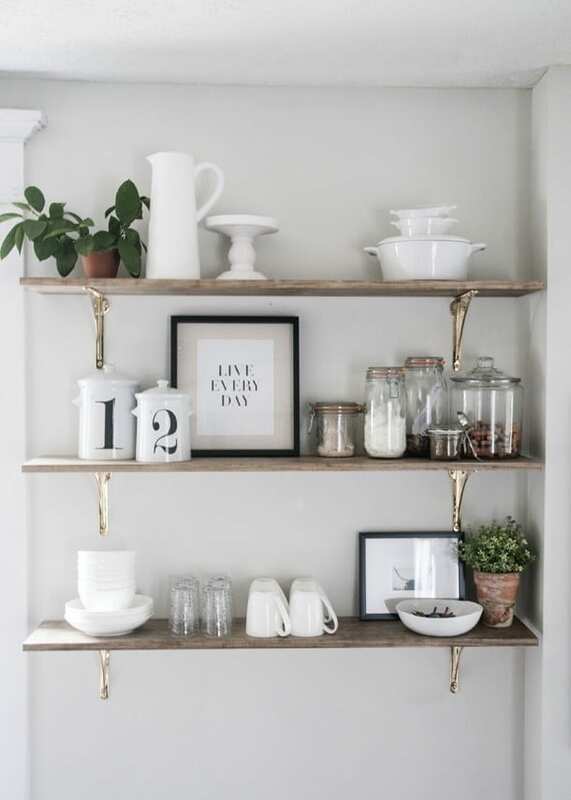 Earnest Home Co. did an incredible job stocking these shelves and playing up the pretty shape of the brass brackets. Bedrooms are always a fun place to add some personality and practicality with DIY open shelving. 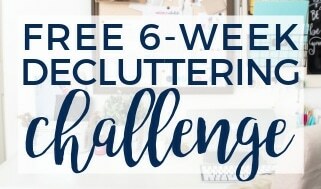 There are so many ideas you can implement, but whether you have an office in your bedroom or just your bed, it’s important to keep things as decluttered as possible so you can rest easy. Here are a few of my favorite cheap shelves in bedrooms. Ikea Spice Rack Cheap Shelves. It’s pretty impossible to talk about cheap shelves and not mention Ikea. I’m especially proud of this DIY—I turned their inexpensive spice racks into some incredible book shelves in my daughter’s room! 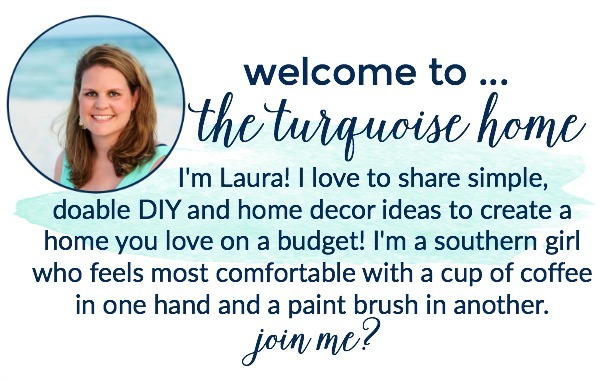 This is the perfect high-impact, low-budget project to try! 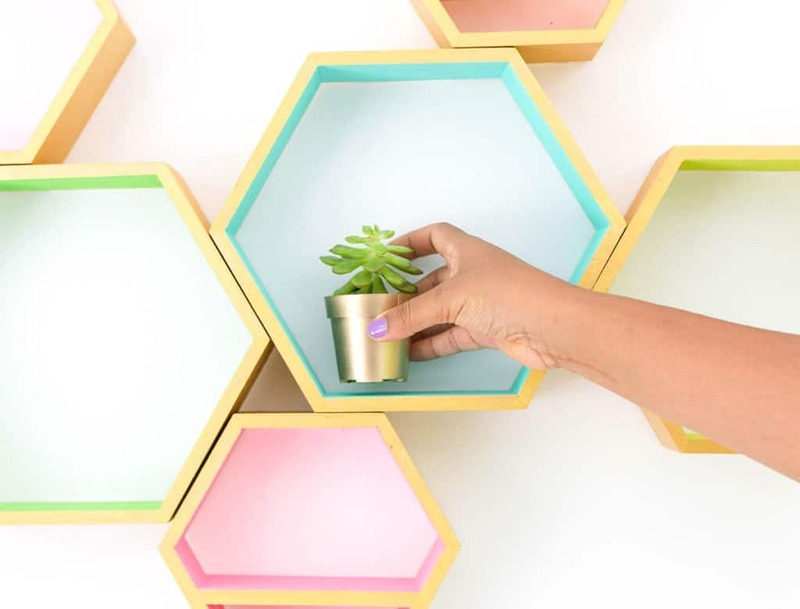 Metallic Hexagon Shelves. 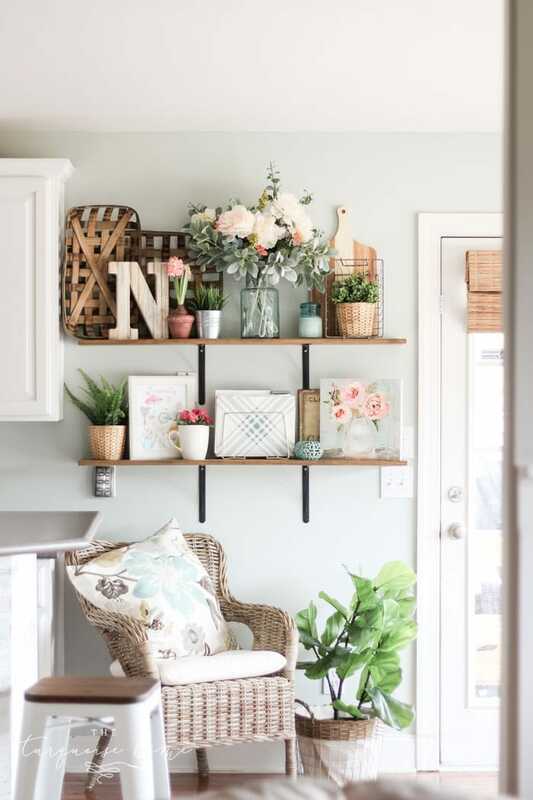 These DIY shelves are awesome for many reasons, two of which are these are affordable diy shelves and you can customize them in any color imaginable! Plus, the shape is so fun and unique that it will serve as a practical focal piece as well. Suspended Wood & Leather Shelf. This is a totally brilliant way to DIY shelving to your room. 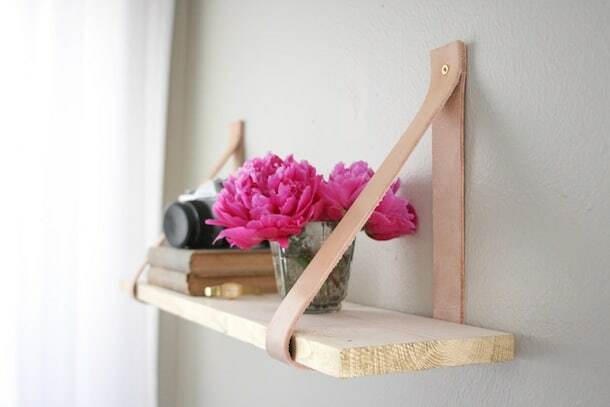 I love the idea of using these leather straps to hang the shelf rather than the usual brackets. Just make sure you use these shelves for more lightweight things. 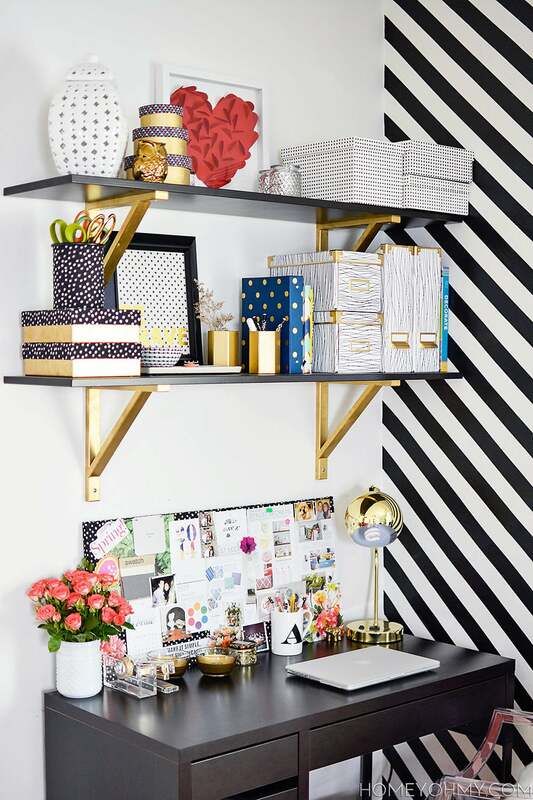 Chic Work Space Shelves. 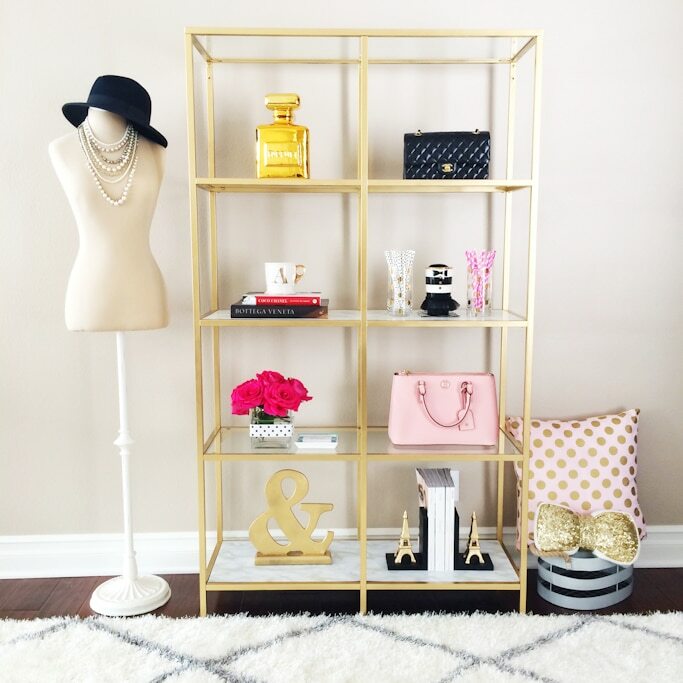 These black and gold DIY storage shelves will add a bit of glam into any room in your home. You may be surprised to hear that these are affordable, cheap shelves and brackets from Ikea! Gold Freestanding Shelves. 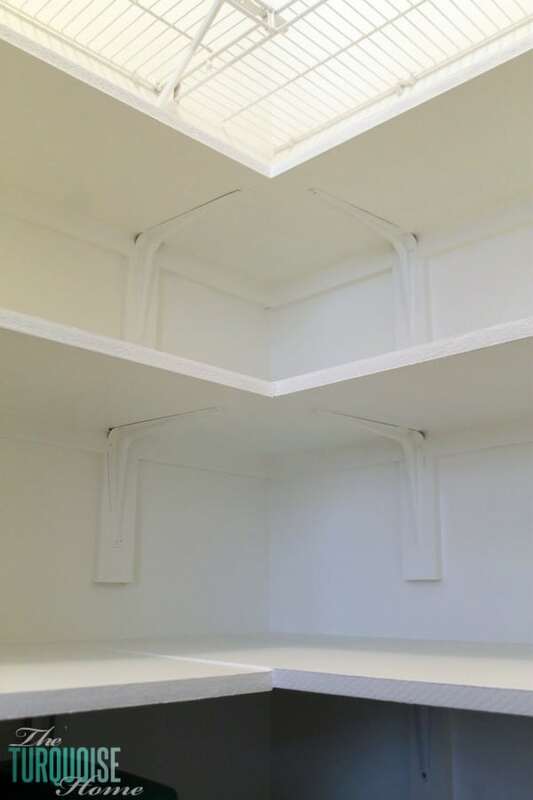 This type of shelving unit is great for someone who is low-commitment or a renter who doesn’t want to damage walls. Ready for another surprise? This gold and marble shelf is actually an Ikea makeover as well! So, maybe DIY closet shelves aren’t the glamorous kind of shelving you see floating around Pinterest, but practical shelves tucked away inside closets add so much function and joy to my life! So much so that I am giving my DIY closet organization shelves a section of their very own! 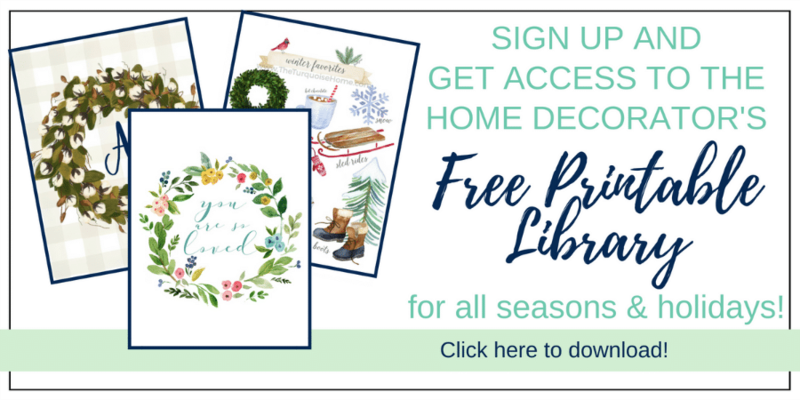 I did this project as part of my nesting while pregnant, and if a woman in her third trimester can make this happen, so can you! This project was way easy—I didn’t even have to cut the MDF boards. I let the experts at Lowe’s do it for me with their massive saw machine! The full process is broken down here. It did take a while to get it done, but these DIY closet shelves were so worth it! See? With very little cash flow and some sweat equity, you can have some amazing cheap shelves throughout your home! Which one of these ideas was your favorite? I am still partial to my closet shelves, believe it or not. Game changer, I’m telling you!